Infineon Technologies’ EVAL-M1-IM818-A evaluation board was developed to support customers during their first steps of applications with CIPOS Maxi IPMs (intelligent power modules). 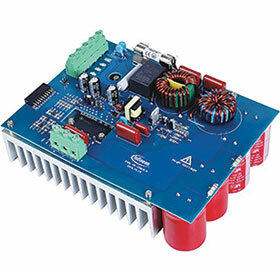 In combination with control boards equipped with the M1 20-pin interface connector, like the EVAL-M1-101T or EVAL-M1-099M, it demonstrates Infineon’s CIPOS Maxi IPM technology for motor drives. The evaluation board features the IM818-MCC, which combines 1200 V Trenchstop IGBTs and emitter controlled diodes with an optimised 6-channel SOI gate driver. It is optimised for industrial applications like high-voltage ventilation and air conditioning (HVAC) fans, fan motors, pumps and motor drives.